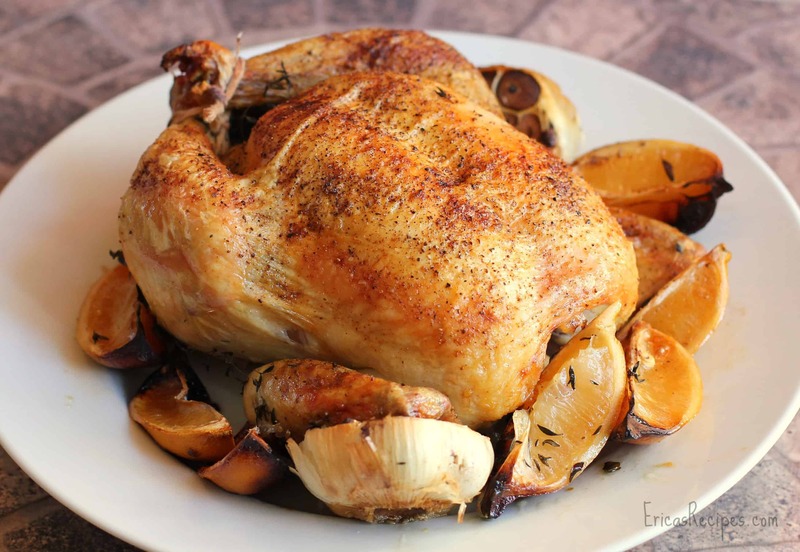 Serving a gorgeous, golden roasted bird to your family is always a big moment isn’t it? Be it a big, beautiful turkey on Thanksgiving or a humble roast chicken for Sunday dinner, whole roasted poultry sure makes a grand entrance. I always brine my birds, and I roast my chicken loaded with lemons, herbs, and lots of gah-lic. Not only does this make the chicken so flavorful and awesome, but I add some of these roasted yum-yums when I make stock. Talk about a succulent, juicy, melt in your mouth bird! Remove the chicken giblets – reserve to make stock later. In a soup pot, combine ~1/2 gallon water, 1/2 c kosher salt, and 1/2 c sugar. Add the chicken and brine in the fridge 6-8 hours. Remove the bird from the brine and pat dry. Place in a 13×9 baking dish. Season well with salt and pepper inside the cavity. Stuff the cavity with herbs, 1 lemon, quartered, and half a garlic bulb. Rub the outside of the chicken with olive oil and sprinkle lightly with salt, pepper, and Old Bay – I say lightly because the seasonings will scorch and blacken the bird if overdone. Tie the legs together with kitchen twine and tuck the wing tips under the body of the chicken. Scatter remaining garlic and lemons around the chicken. Stick remaining herbs around the bird too. 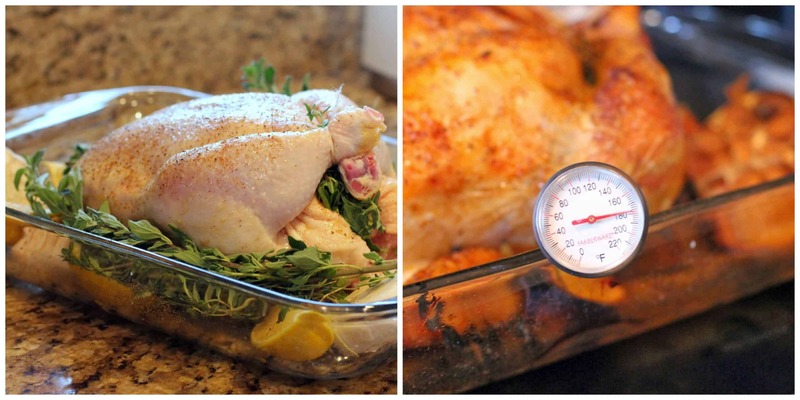 Roast the bird for 1-1/2 hour – 1-3/4 hours or until internal thigh temperature is ~180. Rest 10 min, carve, and serve. – BTW, I save the bones, giblets, roasted garlic and lemons from the pan for making Chicken Stock -YUM! *Note: Regarding the herbs, just use whatever you have on hand. I grow herbs, so I use a bunch of whatever needs to be trimmed which generally ends up being rosemary, thyme, and oregano. I want to eat EVERYTHING you make! Can I just come live with you? 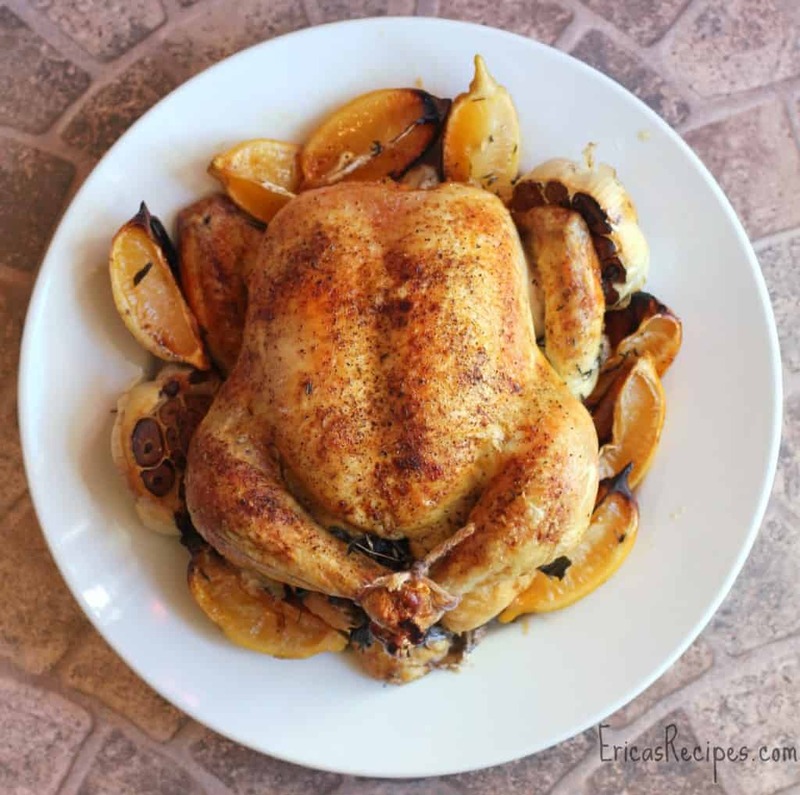 I heart roast chicken and this looks perfect! Moist with a crispy skin. My husband is a crispy roast chicken snob. If it’s not brown enough according to him, then he’ll look at the bird with disdain. And he doesn’t even eat the skin! Weirdo. What a gorgeous dinner. I love your photos! 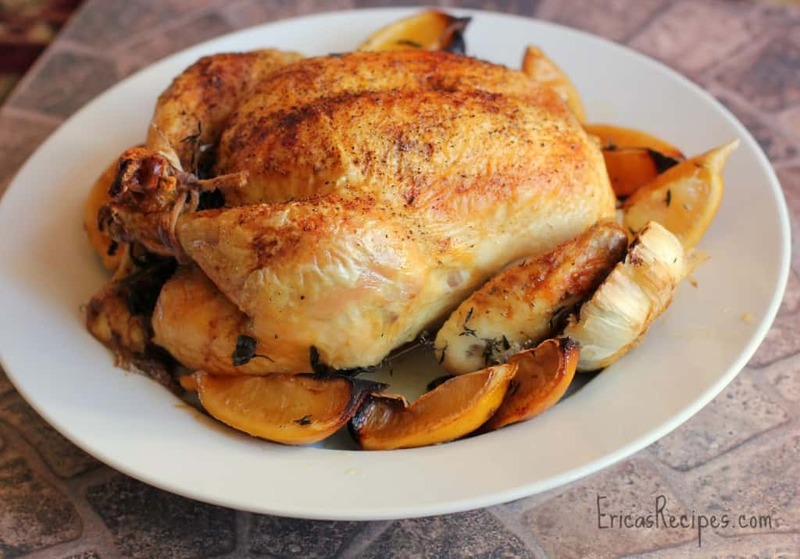 I featured this recipe at my Sunday Dinner Link Party! Thanks for sharing!